Tatuaje founder Pete Johnson as a tribute to monster and horror movies. the series. Each of these releases has been a new blend. The Wolfie is a smaller version of the 2011 release, the Tatuaje Wolfman. 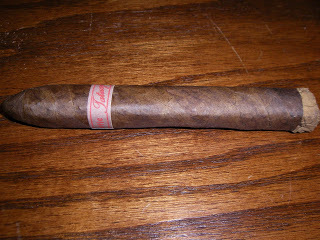 We ranked the Wolfman as the #11 cigar for 2011. With the Wolfie, this was a very good cigar, but one that falls a little short short of the original Wolfman. We also discussed some of the packaging of the Little Monsters Series. There are two items of note from a packaging standpoint. First up, the Little Monsters have no special coffin dress boxes (these were artistic boxes meant to resemble monster coffins that were released as a part of the original Monsters Series). All Tatuaje Little Monsters come in an orange colored cedar sampler box. Secondly, some (not all) of the boxes contain trading cards (consisting of monsters). I was a little surprised Johnson opted for this marketing angle as he already knows the frenzy that surround the Monster Series. It seems to me that the concept of including trading cards in some boxes (while a fun idea) just adds to the frenzy. Let’s introduce the Wolfie and see what this cigar delivers. The Wolfie shares the same blend as the original Wolfman. For completeness, we are treating Wolfman and Wolfie as a single blend and include the sizes below. Both blends are a box-pressed torpedo. scripting” it says “monsters” in the red/orange font. As I do with all torpedoes (and most cigars), I opted for a straight cut into the torpedo tip. I then proceeded to start with the pre-light draw. For the most part the dry draw notes were very similar to the original Wolfman. I detected a combination of leather, cedar spice, coffee, and sweet cocoa notes – giving the cedar spice had an edge. Overall I was pleased with the pre-light draw, so at this time it was time to light the Wolfie and see what the smoking experience would bring to the table. When I assessed the Tatuaje Baby Face, I saw a similar flavor profile to the original Tatuaje Face. In the case of the Wolfie, I found the flavor profile to have more differences from the original Tatuaje Wolfman. Like I did with the original Wolfman, I opted to light the shagged foot of the Wolfie normally and then started smoking it right away (as opposed to totally toasting all of the shag). Given the Wolfie is a Tatuaje product – and Tatuaje products are made at the My Father Cigars’ factory, it was no surprise that I got a pepper blast to start this cigar. I categorized this blast as combination of black pepper and cedar spice. As the burn reached the wrapper, notes of coffee and cream entered the flavor profile and became primary notes. The cedar/pepper spice moved to the background and was joined by some grassy notes. The coffee/cream combination alternated with the grass/cedar/pepper combination in the forefront as the cigar experience progressed. At the same time I also picked up a floral quality on the after-draw. By the early part of the second half, the coffee/cream combination was in control as the primary flavor and was joined by earth notes. It was around this time that the spice seemed to dial back. I also detected notes of orange peel. One thing I was expecting was for the orange peel to develop into the wonderful orange citrus sweetness I got on the original Wolfman. This unfortunately did not happen. In the last third of the Wolfie, the spice re-emerged and joined the coffee/cream/earth in the forefront. The finish had some spice on it. It wasn’t the smoothest close to a cigar, but I wouldn’t categorize it as harsh either. The nub was ideal – it was cool in temperature and firm to the touch. Long time readers of Cigar Coop know I am not a fan of torpedo vitolas. I feel they usually tend to fall short in terms of burn and draw. While I think the Wolfie and original Wolfman would have been much better in a classic parejo shape, these cigars still scored very well in terms of the attributes of burn and draw. The burn of the Tatuaje Wolfie was sharp from start to finish – requiring minimal touch-ups. The ash was salt and pepper colored and for the most part was a tight ash. The Wolfie had an ideal burn rate and burn temperature. As for the draw, it was very good for a torpedo and made for an enjoyable smoke to puff on. I felt that he strength and body of the Tatuaje Wolfie was a bit dialed down from the original Wolfman. I assessed the Wolfman to be a medium to full-strength, full-bodied smoke. I found the Wolfie to be a cigar that will not overwhelm you with nicotine – making it a classic medium strength smoke. The flavor notes have some nice depth to them. I assessed the flavor of the Wolfie to be medium to full-bodied. There was a nice balance with the strength and body of the Wolfie. I’d give the body an edge over the strength, but overall I’d still consider this a balanced smoke in terms of the two attributes. There was one thing the Wolfie missed that I felt the original Tatuaje Wolfman had – and that was the nice orange citrus notes. I felt this gave the Wolfman a nice differentiator. When I smoked the Tatuaje Baby Face, one disadvantage it had to when I assessed the Tatuaje Face was that it didn’t have as much age. This could have been one reason why I gave the original Tatuaje Face the edge. In the case of the Wolfie and Wolfman, I smoked these shortly after each were released. The Wolfie was a cigar I liked, but the Wolfman is a cigar I loved. The Wolfie is still a very good cigar, so that shouldn’t be considered a negative – it is just up against some great competition. Some props to Tatuaje must be given for making a well-constructed torpedo vitola. 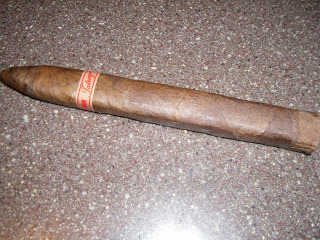 This is a cigar I’d recommend to an experienced cigar enthusiast – and certainly to a Tatuaje fan. This might be a better cigar than the original Wolfman for the novice enthusiast as it is dialed back in strength and body. As for myself, I would still smoke this again.